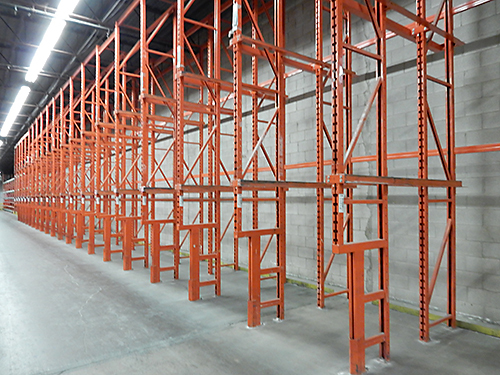 Drive-in & Drive-Thru Pallet Racking – Canadian Rack Inc. The defining feature that separates a Drive-In pallet rack system from a Drive-Thru system is the single opening for the forklift for loading as well as unloading. Both Drive-In and Drive-Thru pallet rack systems offer excellent storage space, however, Drive-In racks are often closed at one end by a wall or other installation. The forklift operators must drive into the racking system from one side and remove the pallets from the same entry point. Drive-Thru pallet rack systems differs from Drive-In systems as they use a First-In-First-Out inventory retrieval system, also known as FIFO. The first pallet loaded on the rail system is conveniently the first pallet to be removed from the other end. This rotation of product through FIFO method makes Drive-Thru pallet rack perfect for date-sensitive pallets. Fast moving items or perishables can efficiently be stored in Drive-Thru rack from the same entry point.